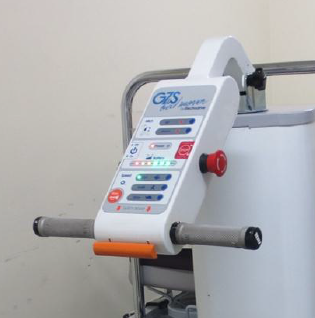 The GZS Bed Mover allows one person to effortlessly move heavy hospital beds. The motorized unit operates equally well with or without a patient– simplifying the task of moving beds or patients between wings, units, departments, OR and patient rooms. This allows the transporter to focus on the needs of the patient during transport. Capacity over 1300 pounds- more than a half ton! The nearly silent motorized unit is able move a hospital bed up or down ramps, over carpet, into elevators, and around tight corners. 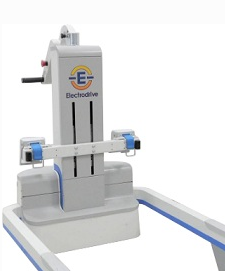 With a capacity of 600kg (approximately 1320 lbs) it has the capacity to move common hospital beds and stretchers. The GZS's compact design, effortless maneuverability and ability to attach to most any bed or stretcher allows for safe and efficient management of a fleet of beds or stretchers within a healthcare environment.